This interesting three-dimensional design is based on the skin of an apple. This interesting three-dimensional design is based on the skin of an apple, which naturally forms a curl as it is peeled off. The texture features a subtle, irregular pattern of dots. 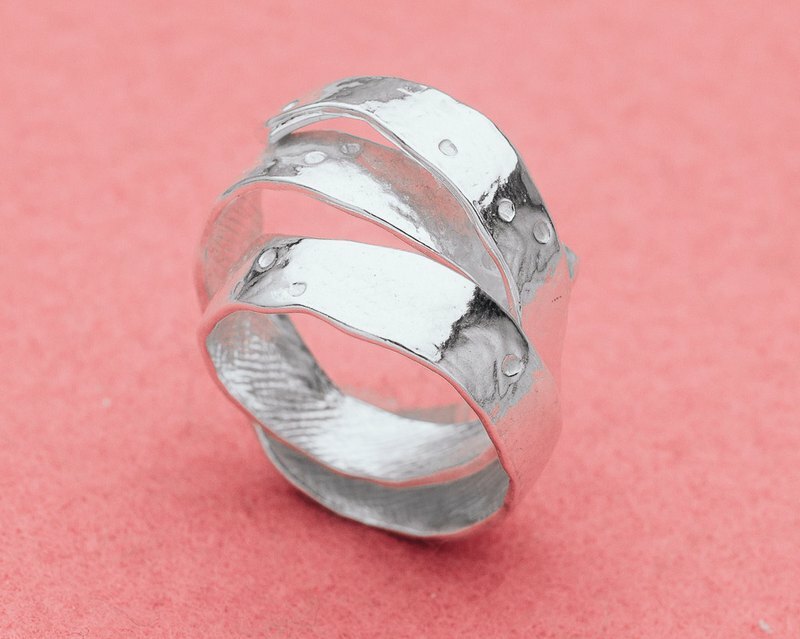 This ring has been designed from three apple peel curls to create an interesting, elegant design. The width of the top of the ring is approximately 15mm, and the width of the bottom is approximately 6mm. The ring sits up off the finger approximately 6mm. Although the ring can be adjusted slightly, please let us know your preferred ring size. Material: Britannia Silver 958 We can also make this piece in 23K Gold Vermeil (23K Gold Plated Britannia Silver 958) upon request. The price will be approximately 25% higher, and will take 3-4 weeks depending on availability. Please convo me for a more accurate quote if interested. ------------ We are a husband-wife, husband's-parents, and two-production-staff team. We make fun handmade, original pieces for fun people in our workshop/store in Ginza Tokyo. Come visit our store if you're in lovely Tokyo. Thank you for looking!